Ridonk is the ridiculous creation of American pool player and entrepreneur Eric S. Townsend — still hustling after 36 years. The founder has won numerous design and marketing awards over a quarter century in business — but this is his first fashion line. Proudly made in the U.S.A. May the pool gods save us all. 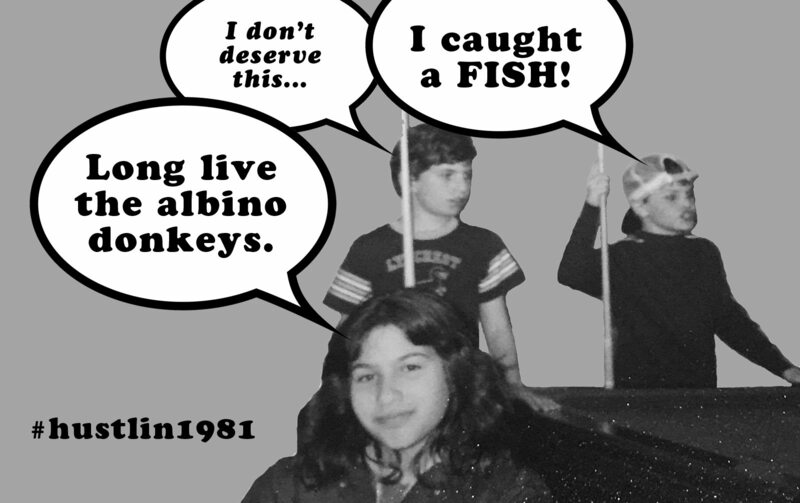 As a child, Eric shot pool at the local rec center (far right above). Yes, the pool cue was taller than he was. His mouth and the cue ball took turns — which could run faster. He entered tournaments in college to help fund his expensive dating habit. He was often spotted in the commons building. There are floor-to-ceiling windows, and a lone table that overlooks a lake. He met his wife, Gwen Townsend (pictured above), at Babe’s Billiards near American University. She was the cute college girl who assigned the tables and kept them clean (a side job while finishing up her studies). She’s gone on to become a leading player on the J. Pechauer Northeast Women’s Tour (JPNEWT) and Action Pool Tour (APT). She was the first woman to advance to a regional event in American Rotation (and was the #1 seed). She’s competed against BCA Hall of Famers Allison Fisher, Karen Corr and Loree Jon Hassan (and studied under Fisher). Eric began to put the best interests of the game first, and commit the time he had for pool to something greater than himself. He served as an APA captain for nearly a decade. He mentored several players along their way to the top of the amateur game. His teams were named division champion on 15 occasions in four different rooms: Buffalo Billiards – Washington DC, Champions Billiards – Arlington VA, Carpool – Arlington VA and Fast Eddies – Fairfax VA. He entered the league a ballbanger and steadily climbed the ranks. He earned earned Most Valuable Player honors three times. In 2007, he reached their highest attainable handicap (7) in his beloved 8 Ball. Eric and fellow poolplayer Brian Cheung eventually left the APA team format. They reached out to Cue Sports International (CSI) to bring the BCA Pool League back to Northern Virginia. They founded NOVA BCA. In the format, Eric has achieved a player average of 8 (a.k.a 42) and a Fargo Rating of 531. His team (also named Ridonk) has been division champs twice. Eric authored Sharking: Don’t Get Fooled Again, a colorful book with a simple antidote to distractions and billiard gamesmanship (available through GoBooklets.com and Amazon). 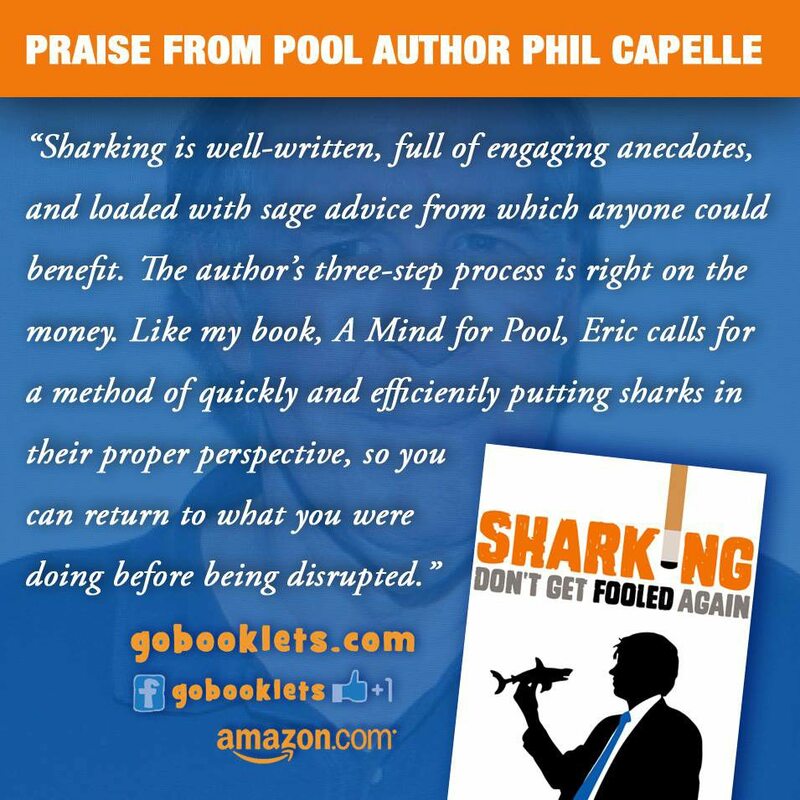 The book garnered praise from Phil Capelle, author of A Mind For Pool and the Play Your Best Pool series (see below). 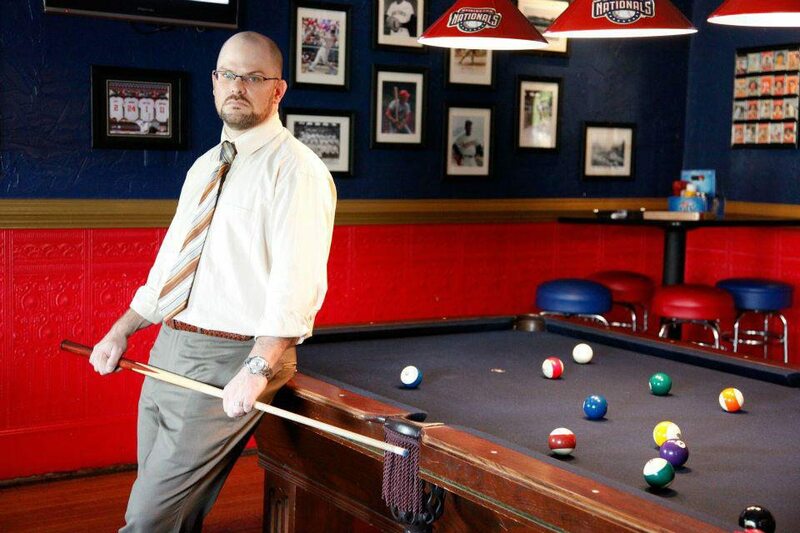 Eric was named the second tournament director for the Action Pool Tour by Ozzy Reynolds (though ultimately he decided to pass the reins and focus more on his writing endeavors). He was hired by professional pool player and billiard instructor Joe Tucker and his business partner Don Owen of OB Cues in support of The American Billiard Club (ABC). He assisted with product development and helped to take American Rotation, its flagship game, to market. At BCAPL Nationals, Eric and Gwen finished in the top 75 pairs in the 8 Ball Scotch Doubles event and Team Ridonk debuted in the Open 8 Ball team competition. Eric was director of the international billiard competition (8 Ball, 9 Ball, straight pool) at the World Police and Fire Games. He worked with Dan Madden from the Pennsylvania 9Ball Tour, BCA instructor and professional stream commentator George Hammerbacher and Lucasi-sponsored professional pool player Shaun Wilkie. 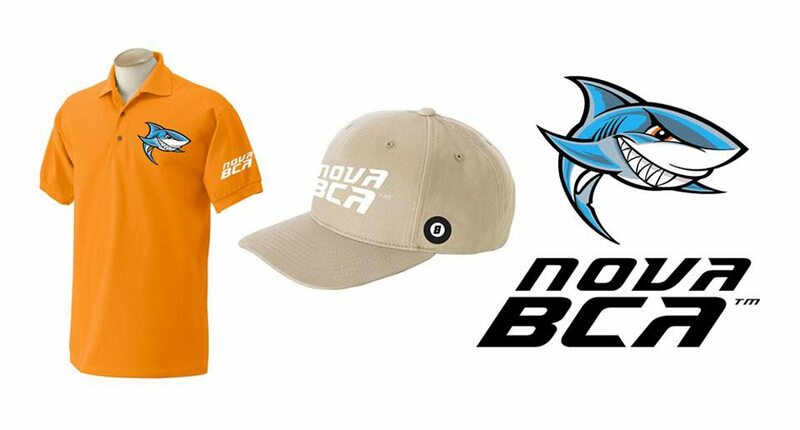 He created NOVA BCA’s differential system to better challenge and reward both new and established players. Team Ridonk took 9th Place at BCAPL Nationals in the Mixed Teams 8Ball event (2,750 points division). They were eliminated in brutal fashion, falling 13-12 after reaching the hill first at 12-10. Their opponents went on to claim 2nd Place in the event. Eric went 13-8 (W/L) for the tournament. 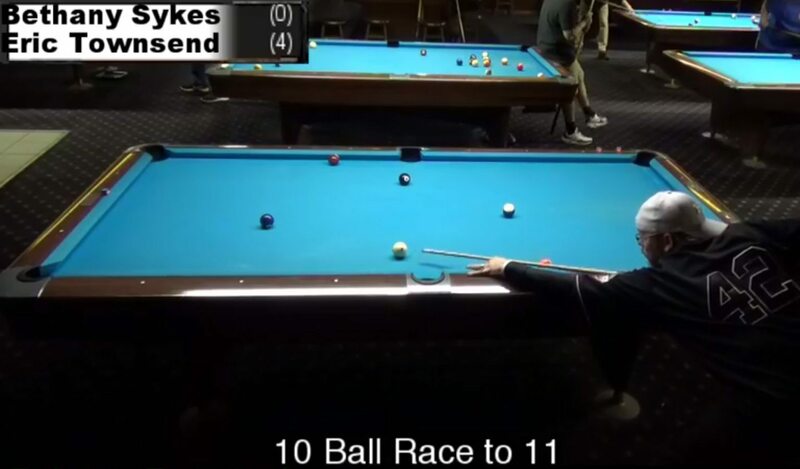 He provided support to Scott and Christopher Wilburn’s NOVA Action (a streamed, head-to-head competition with a Top 10 list you can challenge in 8ball, 9ball and 10ball). He partnered with former APA division representative Donnie Rogan to bring NOVA BCA to its second venue (Hard Times in Springfield VA). The league now plays Tuesday through Thursday weekly.